The following is a listing of the Oceanfront Oregon Coast Beach Rentals in Time Share Resorts which are listed with Resort Condominiums International (RCI) or Interval International (II) Timeshare Exchange Companies. Some Resorts also run a regular Hotel type operation. You do NOT have to be a timeshare owner to take advantage of these often VERY affordable vacation timeshare condo rentals! These resorts are available for Vacation Time share exchanges by RCI or II Timeshare members, and most also have Time Share Condo Rentals available to the general public for Rental Resort Condos by the week and in many cases by the day. There are Resort listings below for: (from North down to South) Lincoln City, Gleneden Beach, Depoe Bay, Otter Rock, and Newport. Unfortunately there are no RCI or II resorts in the area south of Newport down to Florence since there are some beautiful wide sand beaches there. Only Resorts which are right on the Ocean beach and have Beach Access directly from the Resort are listed below in our Oceanfront Oregon Beach Rental list. Add a few days to your Vacation or take a fun mini-Vacation. Check out the discounted and cheap Getaway Vacation Lodging Package Links on our Timeshare Vacation Promotions page. Resort has RCI Resort of International Distinction Award. Small beach front resort offering few amenities, but spectacular views of ocean. Harbor at Depoe Bay Resort sets on a steep hillside. Older RCI Time Share resort with spacious approximately 1,200 sq ft 2-bedroom units - some units have been updated - ask about one you are inquiring on. (preference is higher floors since better views - but no elevator.) Small garage with most units. Check in for these Oregon coast beach rentals is across street at motel - near Coastal Hwy 101. Path and Steep stairs down to small secluded beach area available when tide is out. Two miles to larger beach area. All 2-bedroom units with full kitchen and washer/dryer in unit. This link takes you to RCI - The Harbor at Depoe Bay Resort pictures and Amenities listing page. This link goes to the Harbor at Depoe Bay web site where you can see many more pictures plus contact Info regarding Oregon coast beach rentals. 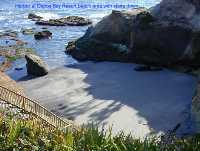 Basic rental rate is $165 per night - call for specials or weekly rates on this Depoe Bay Rental. Share your own Oregon Coast Rental, Exchange, or Owner "Review" below. You Might be a Winner in our Contest! Read candid user reviews and see Depoe Bay Vacation Rental Resorts & Hotels ranked by popularity with comparison pricing at this link: Find the best deal, compare prices and read what other travelers have to say about hotels in Depoe Bay at TripAdvisor for Depoe Bay Rental Resorts & Condos. Beach front and non beach front listings for Oregon coast beach rentals in Depoe Bay are shown. Click "B&B/Inns" Tab on above page for User Ratings and Comparison Pricing for 4 Depoe Bay Bed & Breakfast's & Inns. Click here to go to new Google "Local" Satellite Image & map of Depoe Bay Resorts - with "Hybrid" view of street map superimposed over the Satellite Image. Oregon Coast Ocean front and Ocean View Resorts are shown. Can easily move view or zoom in or out with buttons on image page or use the arrows on your keyboard for more precise control. Click Resort Name on left to jump direct to that location on the Aerial Map. "Local" Satellite Maps can be very useful - interesting to zoom in for close view! RCI Gold Crown Resort + Interval International Five Star Rating. Large WorldMark Resort with many amenities including: Children's Pool, Exercise Equipment, Large Game Room, and Playground Area . Built in about 1997 and refurbished in 2003. Many optional Resort Activities during the week. Handy location on Oregon Coast between Newport and Lincoln City. Share your own Oregon Coast Beach Rental, Exchange, or Owner "Review" below. You Might be a Winner in our Contest! 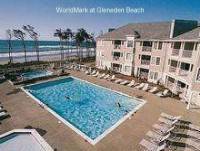 WorldMark Gleneden Beach Resort has 1, 2, and 3 bedroom units. Full kitchen and washer/dryer in all units. All units have deck with BBQ grill - some decks face ocean directly - some decks have "side view" of ocean. We think all living room windows face ocean directly - ask to be sure. Starfish and Sand Dollar buildings are the front buildings next to the beach and ocean - Seabreeze is back building and further from bluff overlooking ocean where front 2 buildings are located. WorldMark Gleneden Beach Resort gets high reviews from users. Great location on central Oregon coast for Oregon coast beach rentals. To RCI Web Page on WorldMark Gleneden Beach Resort with pictures and amenities. This link goes to the WorldMark Gleneden Beach Resort web site with pictures, local attractions, and contact Info. Read candid user reviews and see a Gleneden Beach Vacation Resort with pricing at this link: Find the best deal, compare prices and read what other travelers have to say about hotels in Gleneden Beach at TripAdvisor for Gleneden Beach Oregon Coast Vacations. Small 18 unit RCI Affiliated Resort with RCI "Hospitality" award. Friendly Family run Resort located on cliff overlooking the ocean. 132 steps down to ocean beach - be in shape for return trip up! Is a car ramp down to beach 1 block away. Two and three story sections of building - no elevator. Three 2-bedroom 1 1/2 bath units with a jacuzzi & fireplace and 15 1-bedroom units. Some of 1-bedroom units are much smaller and do not have a fireplace or jacuzzi - ask which you are getting. No resort Amenities, no pool, no activities - just spectacular Ocean views. Higher floor units will have a better view of ocean waves on beach looking over the edge of the cliff than first floor units which may have to walk out to fence by cliff. Traffic in Lincoln City can get heavy during the Summer months, especially on weekends. To RCI lookup page for Info and pictures on Sandpiper Condominium. (NOTE - RCI has no direct Link for Sandpiper -- have to select Oregon in the "State" drop down box, type in "City" as Lincoln city, and click "Search Button") Sandpiper does not seem to have a web site where can check out Lincoln City beach rental options. Call phone # above. Read candid user reviews and see 29 Lincoln City Vacation Resorts & Hotels ranked by popularity with comparison pricing at this link: Find the best deal, compare prices and read what other travelers have to say about hotels in Lincoln City at TripAdvisor for Lincoln City Beach Rental Resorts & Hotels. Listings for beach front and non beach front Oregon coast beach rentals for Lincoln City, OR are shown. Click on the "B & B/Inns" tab on above page for User Ratings and comparison prices of 4 Lincoln City area Bed and Breakfast's & Inns. Share your own Oregon Beach Rental, Exchange, or Owner "Review" below. You Might be a Winner in our Contest! Click here to go to new Google "Local" Satellite Image & map of Sandpiper Condominiums Resort - with "Hybrid" view of street map superimposed over the Satellite Image. Oregon Coast Ocean front and Ocean View Resorts are shown. Can easily move view or zoom in or out with buttons on image page or use the arrows on your keyboard for more precise control. Click Resort Name on left to jump direct to that location on the Satellite Map. "Local" Satellite Maps can be interesting - fun to zoom in for close view! Large older RCI affiliated Resort built in 1971. Carries RCI Resort of International Distinction designation. 450 feet above the beach - 80+ steps - some units have a great view of ocean, some have none - definately ask about rental you are considering! Individual Condo units are mostly Owner owned, many by year around residents. Several Bedroom sizes of units here - varying levels of unit maintenance. Many resort amenities - but may be limited exchange or rental availability - very few units are in RCI for exchanges. Availability for Condo Rentals may be better, however. Parking is some distance from units, so may walk a lot here unless the Tram from the parking lot up to the units is running. Seals are often spotted down on the beach. Close to many attractions at Newport and Lincoln City. To RCI - Otter Rock Timeshares resort Info and pictures lookup page. (NOTE - RCI has no direct Link for Otter Rock Resort -- have to select Oregon in the "State" drop down box, type in "City" as Otter Rock, and click "Search Button") Otter Rock Timeshares Resort web Site lists several "specials" so can check out Oregon coast beach rentals at Otter Rock. Read candid user review and see Otter Rock Vacation Resort pricing at this link: Find the best deal, compare prices and read what other travelers have to say about hotels in Otter Rock at TripAdvisor for Otter Rock Oregon Vacation Rentals. RCI Gold Crown Rating - Interval International 5 star. Older beach front Resort with interesting architecture. Some units do not face ocean - ask about one you are considering. Units 501 - 511 are closest to the ocean. One and 2-bedroom units of various sizes - ask. All have full kitchen, fireplace, and jacuzzi. Clubhouse has exercise equipment, indoor swimming pool, racquetball, sana, pool table, and outdoor glassed in deck overlooking the ocean. Many optional resort activities. Share your own Oregon Beach Rental or Exchange, "Review" below. You Might be a Winner in our Contest! Private trail and steps lead down from Resort to the Beach. The units were remodled in 2002. Resort gets good reviews from users. To RCI - Schooner Landing Web page with pictures and amenities. This link goes to WorldMark Schooner Landing Resort Web page with rental seasons schedule, contact Info, and local attractions. Schooner Landing is a good Oregon coast beach rental option. Read candid user reviews and see 15 Newport Oregon Beach Rental Resorts and Hotels ranked by popularity with comparison pricing at this link: Find the best deal, compare prices and read what other travelers have to say at TripAdvisor for Newport Oregon Rentals, Hotels & Time Share Condos. Ocean front and non ocean front listings for Oregon coast beach rentals in Newport. Click on the tan "B & B/Inns" tab on above page for User Ratings and comparison prices of 6 Newport area Bed and Breakfast's & Inns. Our Site Viewers user experiences and "Reviews" that could help other visitors to this Oregon Coast Beach Rentals page make a decision as to which Oceanfront Timeshare Resort to pick for their Vacation Rental or Exchange. Please include the approximate date you were at the Resort. You can comment on such things as: the View, the Furnishings, Maintenance, Resort Amenities, Beach, Staff, etc -- anything about the Resort you enjoyed on your stay. If you want, you can also include any "Rants" or comments about things you thought could have been done better at the Resort or by the Resort Staff. (If the commenta are extremely critical, we may need to offer the Resort the opportunity to respond in the comments to your "Review," so try to not go off the chart on this!) Include your "Star" Rating for the Resort out of a possible 5 stars for high. It would also be fun and helpful for our Viewers if you would include your favorite attraction(s) or thing(s) you did while in the area. AND -- (for Gene and interested others) -- mention your favorite Waterfront Restaurant where you dined on your Florida Beach Vacation. Your Oregon Vacation Resort Condo Rental "Rave and/or Rant" -- Your User "Review"
Have you had a great Vacation experience at one of the Oceanfront Vacation Timeshare Resorts listed above? Share your Resort User and Experience with the Viewers of this page + maybe even your Area Tips! You can also "Rant" if your Resort experience wasn't so great. Include your thoughts about the Condo and the Resort, as well as any Tips that might help our Viewers. This Link goes to a Resort Condomonium International (RCI) Resort Directory selection page where you can do a quick look up of pictures and amenities of RCI Oregon coast beach rentals and Timeshare Resorts which are on the Beach. Click in Search by "State" bullet circle from the 3 choices. Then select Oregon from the drop down list and leave the "City" field blank -- then select "Beach" in the "Amenities" box and you will get a list of 19 possible RCI Oregon Beach Timeshare Rental Resorts. Only the 5 Resorts listed above are Oceanfront Resorts with direct beach access. The rest are either "Ocean View" with no beach access, or not on the ocean. Several do overlook a harbor. Tip Notice that a link to the RCI Directory resort description and pictures is available, as well as the direct link to the Resort Web site so you can easily check on their availability and pricing of Ocean-Front Florida Vacation Beach Rentals. The links to the Resort Web Sites are also given above. Tip If you search in any other areas, watch for "Beach" to be under the "On Site Amenities" list Vs "Nearby" if a beach front resort is important to you. You you can look at Resort pictures and amenities on the seven II Resort pages. -- Note that only the WorldMark Gleneden and the WorldMark Schooner Landing have "Beach" under the "On Site" Amenities listing - and thus are included on the list above. The list includes some Oregon Coast Resorts which offer Ocean Views, but no beach access. Tip Notice that a link to the II Directory resort description and pictures is available, as well as the link to the Resort Web site (in small type near top) so you can easily check on their availability and pricing of Oceanfront Oregon Coast Beach Rentals. We have also included the Resort link above. The resorts on this list have great views of the Ocean, Bay, or Harbor, but nearby Vs direct access to the beach as ones on the above list feature. Favorite area Oceanfront Oregon Coast Beach Rentals, Vacation Time Share Exchanges + area attractions and places of interest you found interesting or memorable. Oregon travel discount or rental web sites which you have discovered that are not mentioned here. Comments on great Time Share Oregon beach rentals and Resort Timeshare Exchanges (preferrably beach front) you may own or have exchanged to -- or any favorite Oregon beach front Rentals or Condos you have discovered.